William-Adolphe Bouguereau (1825-1905), The Four Seasons (1854-55), oil on canvas, each 185 x 90 cm, location not known. Wikimedia Commons. Towards the end of his life, Nicolas Poussin’s hands developed a severe tremor which made painting fine details very hard for him. Despite that, his final years saw some of his greatest landscape paintings, and standing head and shoulders above those is his series of the Seasons, believed to have been painted between 1660-64. Each of these is not just a fine painting of an idealised landscape, but includes narrative referring to a Biblical story. They not only move through the seasons of the year, but through the times of the day, starting in the early morning of Spring, and ending at night for winter – a device used by later artists such as William Hogarth. In the Louvre, known for its many great treasures of art, they are among the most sublime and important of all its riches. 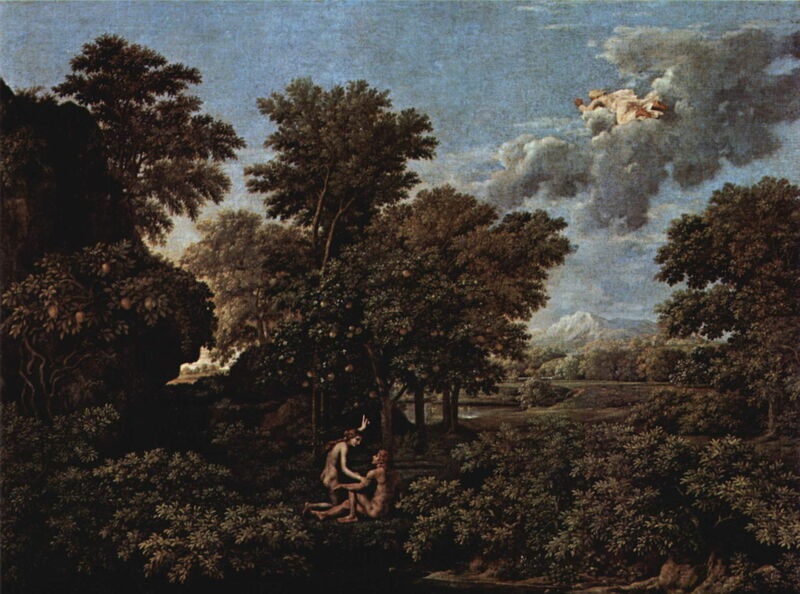 Nicolas Poussin (1594–1665), Spring (c 1660-64), oil on canvas, 118 x 160 cm, Musée du Louvre, Paris. Wikimedia Commons. Spring starts with the beginning of the Bible, with the story of Adam and Eve in the Garden of Eden. Eve is persuading Adam to join her in an apple, the opening step of the Fall. Nicolas Poussin (1594–1665), Summer, or Ruth and Boaz (c 1660-64), oil on canvas, 110 x 160 cm, Musée du Louvre, Paris. Wikimedia Commons. 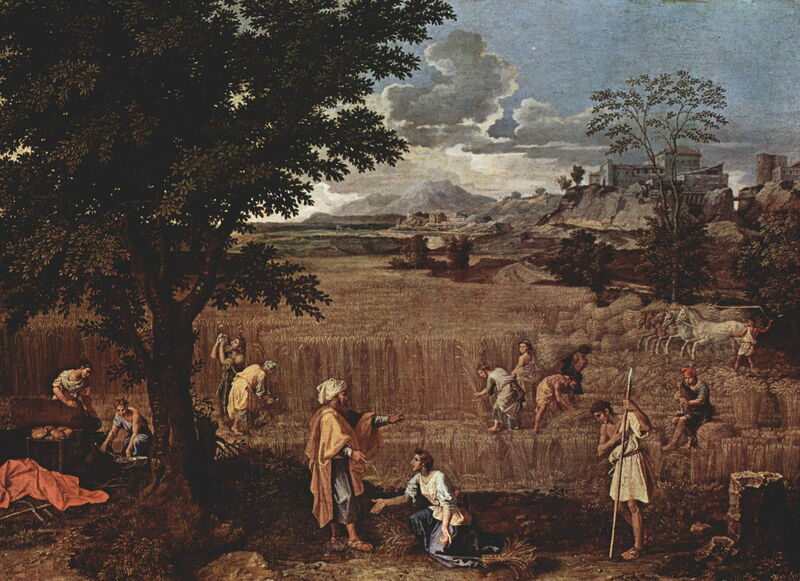 For Summer, Poussin chose the story of Boaz discovering Ruth gleaning after the wheat had been cut in his fields, as told in the Book of Ruth. In its contrasting Italian coastal setting, this overlaps with the earlier paintings of the Brueghels and others. Nicolas Poussin (1594–1665), Autumn (1660-4), oil on canvas, 118 x 160 cm, Musée du Louvre, Paris. Wikimedia Commons. 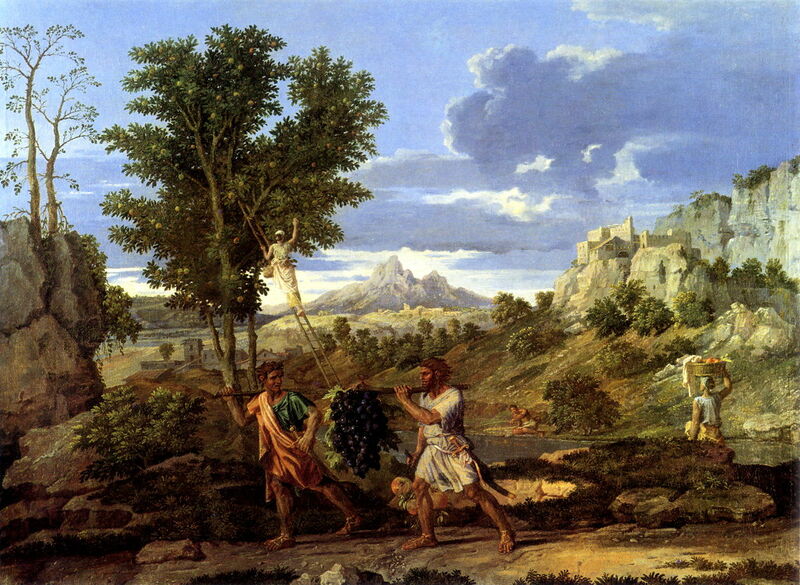 Poussin refers to a story from the Book of Numbers for Autumn, in which Israelite spies visited the Promised Land, and brought back grapes as evidence of what lay ahead. 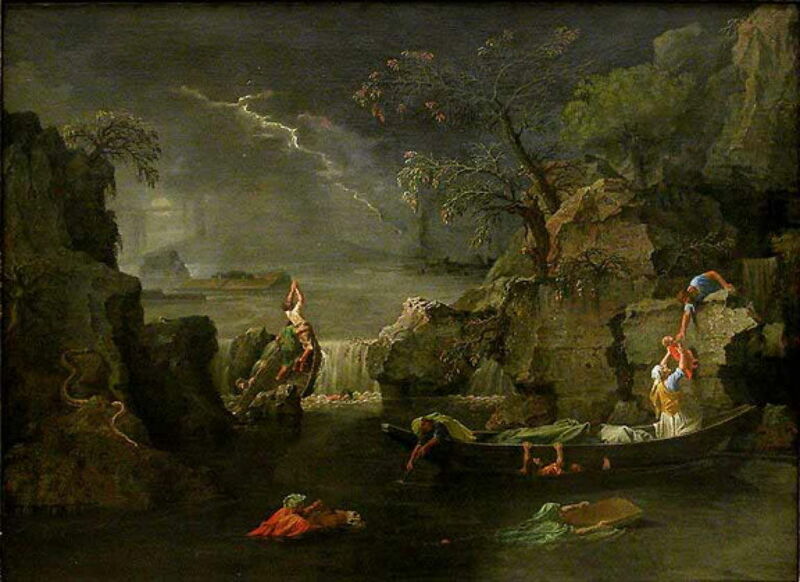 Nicolas Poussin (1594–1665), Winter or Flood (c 1660-64), oil on canvas, 118 x 160 cm, Musée du Louvre, Paris. Wikimedia Commons. Winter returns to the Book of Genesis, to show the great flood, with lightning crackling through the sky, and a few survivors trying to escape the rising waters. This also shows Poussin’s lifelong dread of snakes: one is slithering up the rocks on the left, and from memory I think that there is another in the water, although I can’t see it in this image. Early in William-Adolphe Bouguereau’s career, in 1854, he was commissioned to paint a series showing The Four Seasons (1854-55) for the music pavilion in the garden of the Monlun banking family in La Rochelle. In keeping with their opulent surrounds, these were painted on gold grounds, a layer of gold leaf into which the artist embossed a geometric pattern to result in this unusual appearance. Bouguereau painted a series of young women with seasonal attributes. These include the flowers of Spring, with their reference to Flora, sheaves of ripened corn (Ceres), a bacchante with her goblet of wine and thyrsus, and wrapped up for winter with snow on her clothing. But the greatest series of mythological allegories of the seasons is that painted – as with Poussin – in the final few years of Eugène Delacroix’s life. 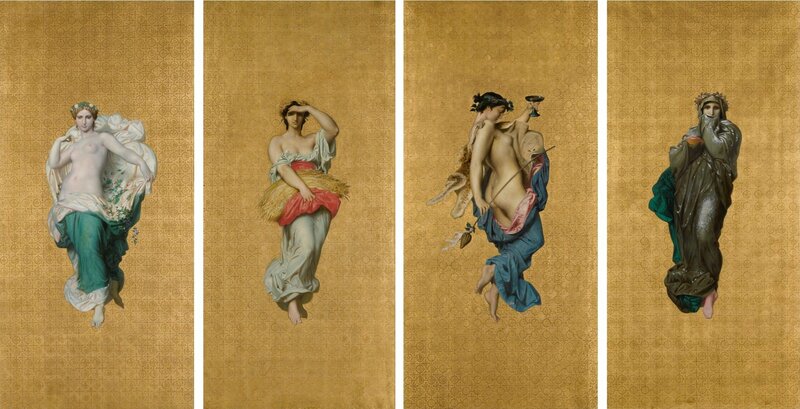 These were commissioned by the Alsacian industrialist Frederick Hartmann, and completed just before the artist’s death in 1863. Although considered to be allegories, in that they don’t directly show each season, they are unconventional in using stories from classical myths which are tied into the seasons. Eugène Delacroix (1798–1863), Spring – Eurydice Bitten by a Serpent while Picking Flowers (Eurydice’s Death) (1856-63), oil on canvas, 197.5 x 166 cm, Museu de Arte de São Paulo (MASP), São Paulo, Brazil. Wikimedia Commons. 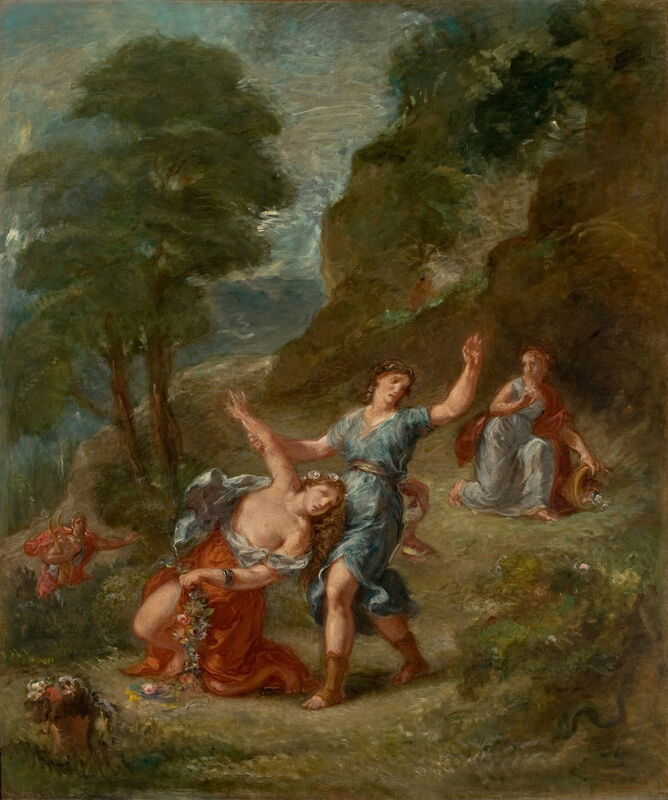 For Spring, Delacroix chose Eurydice Bitten by a Serpent while Picking Flowers (Eurydice’s Death), in which the bride Eurydice is bitten on the foot (or ankle) by a snake shortly after her wedding, and dies. I’m not aware of any deeper connection between Eurydice or Orpheus and this season. Eugène Delacroix (1798–1863), Summer – Diana Surprised by Actaeon (1856-63), oil on canvas, 197.5 × 166 cm, Museu de Arte de São Paulo (MASP), São Paulo, Brazil. Wikimedia Commons. 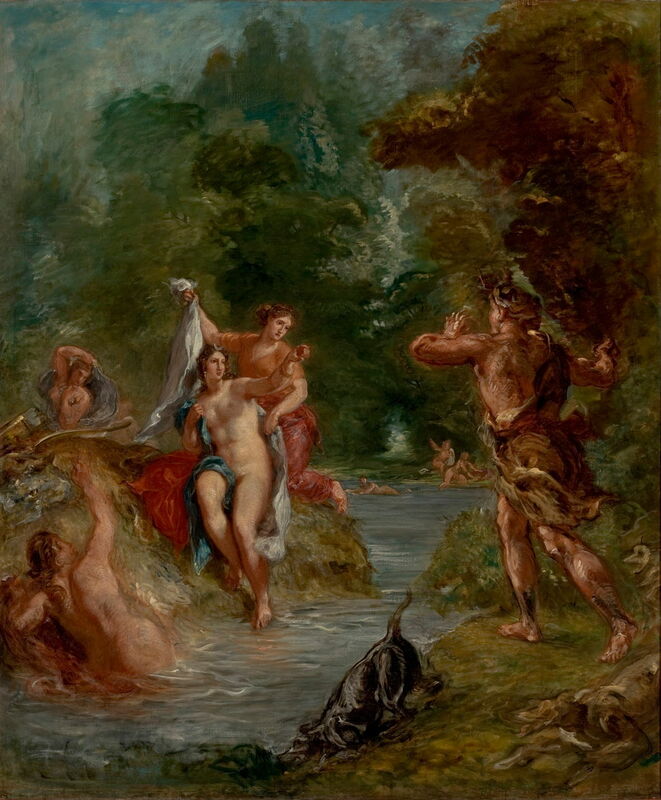 For summer, the story is another tragic myth of Diana Surprised by Actaeon, which is again set in the season shown. Actaeon stumbled across the goddess bathing when he was out hunting; as a result of his unintentional glimpse of her naked body, he is turned into a stag and killed by his own hunting dogs. Already here he can be seen in transition, with antlers growing from his head. Eugène Delacroix (1798–1863), Autumn – Bacchus and Ariadne (1856-63), oil on canvas, 197.5 x 166.5 cm, Museu de Arte de São Paulo (MASP), São Paulo, Brazil. Wikimedia Commons. 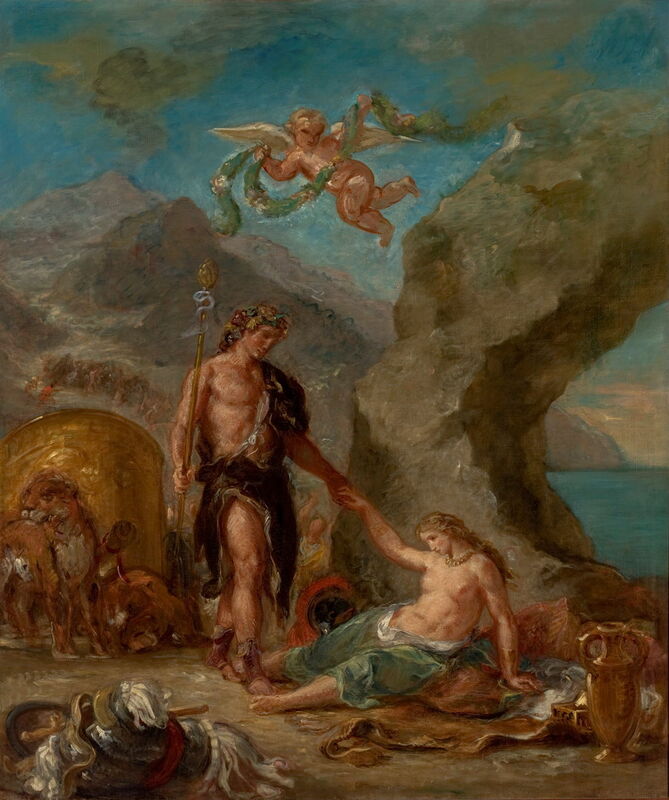 Delacroix’s choice for autumn draws on the common association between that season and wine, in Bacchus and Ariadne. After being abandoned on the island of Naxos by Theseus, who had promised to marry her, Ariadne is discovered by the young Bacchus. Here, Bacchus has just arrived and is helping the gloomy and despondent Ariadne to her feet. They fall in love and marry. Eugène Delacroix (1798–1863), Winter – Juno Beseeches Aeolus to Destroy Ulysses’ Fleet (1856-63), oil on canvas, 196 x 166 cm, Museu de Arte de São Paulo (MASP), São Paulo, Brazil. Wikimedia Commons. For the final season of winter, the artist chose Juno Beseeches Aeolus to Destroy Ulysses’ Fleet, which has suffered a slight conflation between the stories of Ulysses and Aeneas. 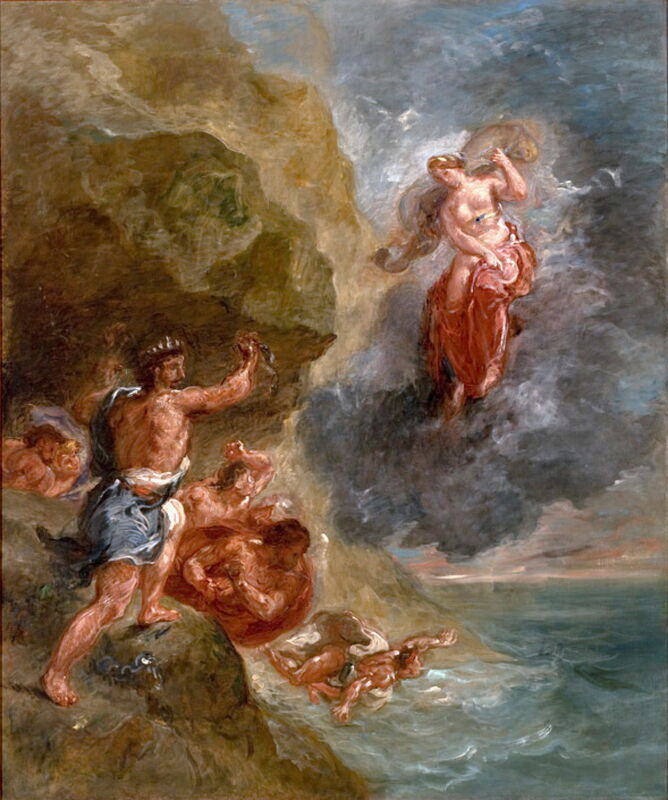 In the Aeneid, Juno offers Aeolus a nymph as a wife if he will let loose his winds on the fleet of Aeneas. That he does, and the fleet is driven onto the coast of North Africa – in what was surely a winter storm. Alphonse Mucha (1860–1939), The Four Seasons (c 1897-1900), prints, further details not known, The Library of Congress, Washington, DC. Wikimedia Commons. 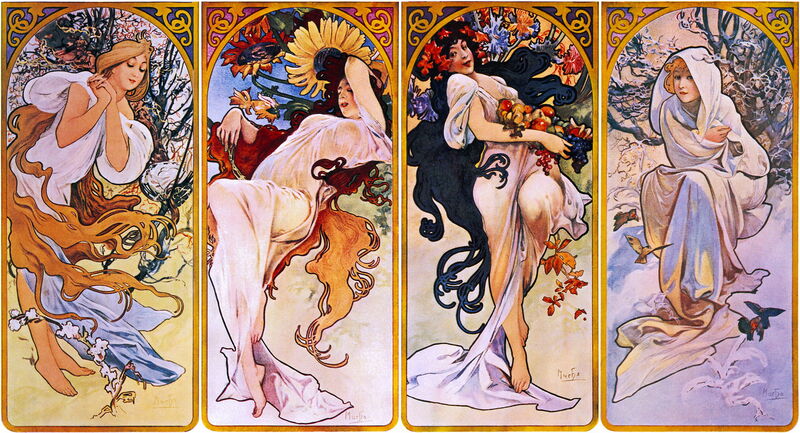 At the end of the nineteenth century, Alphonse Mucha made several series of prints showing the four seasons. Among these is The Four Seasons, probably from around 1897-1900. These make interesting comparison with the more traditional paintings of Bouguereau above. The seasons are an important and pervasive feature of much of the art of East Asia. I have chosen one relatively modern example which is straightforward to read. 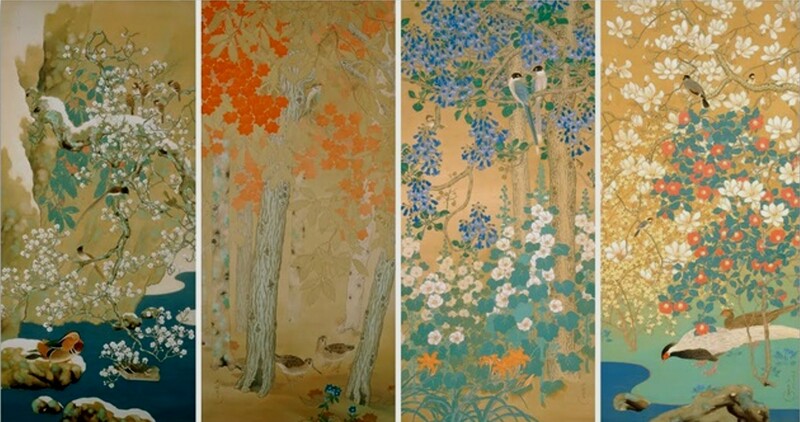 Araki Jippo 荒木 十畝 (1872–1944), 四季花鳥 Birds and Flowers of Four Seasons (1917), colour on silk, dimensions not known, 山種美術館 Yamatane Museum of Art, Tokyo, Japan. Wikimedia Commons. Araki Jippo 荒木 十畝 painted Birds and Flowers of Four Seasons 四季花鳥 on silk in 1917, a fascinating comparison with the landscapes of de Momper. Posted in General, Life, Painting and tagged Araki, Bouguereau, Delacroix, landscape, Mucha, myth, narrative, painting, Poussin, season. Bookmark the permalink. I’ve often seen paintings entitled ‘Spring’ etc., and didn’t realise they were probably one of a set of four. I’ve enjoyed learning about this here. I love the completeness of the sets. I’m now wondering if any Australian artists have ever portrayed our four seasons in four images. Thanks for all you do. It’s very enjoyable reading. I don’t know whether any of the Australian Impressionists painted a complete series of four seasons, although I do recall at least one of their paintings which specified the season in its title. Happy hunting! What are those huge files doing in Mojave’s Desktop Pictures?